Since I posted yesterday….and didn’t even KNOW it….I thought today I would do so willingly. 🙂 One set of kids came through in route home yesterday. As we were driving to see hubby at his store…who….by the way….worked 18 hours on his feet yesterday and almost as many the day before…..we spotted Santa in his workshop! I was driving, so decided we should probably have a little visit with him. 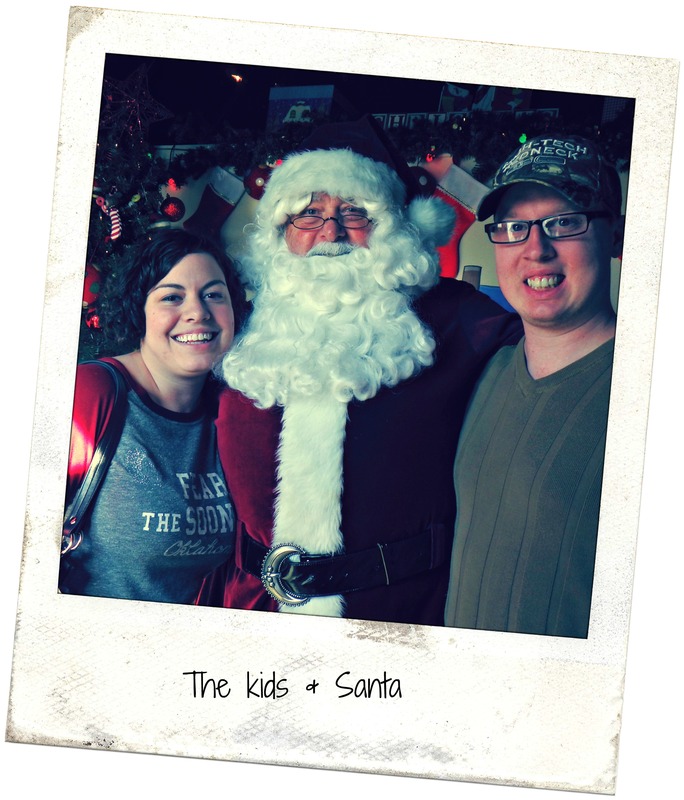 Dragging my reluctant adult children….Santa and his helpers were not quite certain what to think of the trio of “big” kids. As I sat “lightly” on his knee, his helper reassured me not to worry about it hurting him, claiming ~It’s a new knee, it should hold ~ Well that was reassuring! This Santa seemed rather bashful, again, it may have been the present company, but he did ask the expected question, ~ What would you like for Christmas? To which I replied ~My husband, at home. He shook his head as if to understand. I know he didn’t, but perhaps the real Santa does. So here’s hoping that you get to have a visit with Santa sometime this month. Now I turn the question to you….If but one thing….what would you ask for? This entry was posted in Christmas, Curiosity, Family, Oklahoma, Relationships and tagged Christmas with santa, December, Santa wishes, What do you want for Christmas?, Wishes, worked to death. Bookmark the permalink. 43 Responses to What Do You Want for Christmas? 😀 yes, the wish around the world…so true. Salad Monday, ugh. 😉 So true. So many changes in all of your lives right now, R…..proud of how you are handling it. I know he misses you…. Thinking good thoughts! I would ask that no person would ever be motivated by fear to do, or refrain from doing anything. You and your family are living proof that you never outgrow Christmas magic. I hope you get your wish. My Christmas wish is for Eli to be safe at home from Argentina, Bea to be home from school, and our little family all together again, even for a little while. That’s all I want for Christmas. Thank you, Paula. You too! This is a fun post! Love the pictures and that you angled them (have no clue how to do that) and the new knew comment was priceless! I hope your husband gets to spend more time at home …soon! Did you see him as well? 🙂 When he sees the cold that is on his way…he may just head on outta here! Besides all of us wanting world peace and a cure for cancer, I want someone to come and purge my walk-in closet from all the seasonal things crammed in there and to toss out all the crafty materials that I know I’ll never use again. Santa should be thankful I didn’t sit on his new knee after me eating Thanksgiving leftovers and pecan pie for two days. I declare a week’s vacation for your hubby. Well, I am asking for the hubby to be home as well. Maybe in 10 days or 22 but either way it won’t get here fast enough! 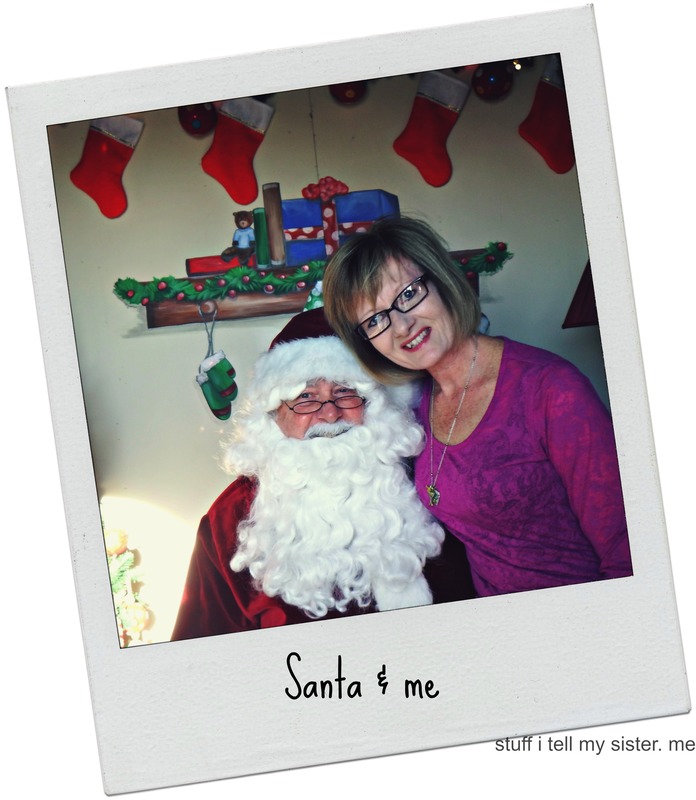 It’s awesome to read that you are in touch with your inner child as to enjoy a Santa visit! Lovely Santa, all I like is a calm and peaceful time with my boys, be together and enjoy it! The new knee is just too cute! I love that you sat with Santa, and I wish for kindness to prevail among more of ‘us’ and and one more year of my kiddo believing in all of the magic. There a a few other things I’d like too 🙂 but those are the most important! I think it’s all about the jelly. Fun pictures. I’d love to see the war in Afghanistan be over once and for all and for the powers that be keep us out of further foreign conflicts. That is great! I have a young adult friend who donned an ugly Christmas sweater and had a santa photo taken with his looking like he was screaming/crying and Santa trying to console him. The best Santa pic ever! Scott White is his name, you may know him. How fun that you all went to see Santa! I’m sure Santa knows how much you want your husband to have a rest. Will things slow down for him after the first of the year? Or do all the holidays keep the store hopping all year long? Cannot wait to read your latest book!! !